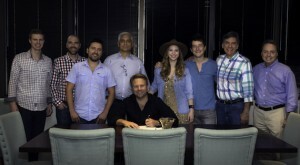 Aaron Scherz, the co-writer/co-producer behind Maddie & Tae‘s hit “Girl In A Country Song,” has signed an exclusive publishing agreement with Nashville-based music publishing house Liv Write Play. The company’s roster also includes Olivia Lane and Leland Grant. Scherz co-wrote five songs included on Maddie & Tae’s debut studio album, as well as the duet “Enough” performed by Reba and Jennifer Nettles. His tracks have also been featured on the series Nashville and The Music of Nashville soundtracks.